Note that the entire Office is done in choir every day; of course, most of that would have been in recto tono. We may also note that the traditional discipline was maintained of having two Masses in choir on certain days, one after Terce for a feast, and another after None for a fast day coinciding with it. 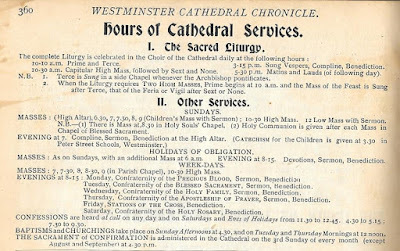 Mr Hawker informs me that whenever there was only one Mass to be said, Westminster had an indult from the SRC to say it after Terce, even if it was that of a fast day, which would traditionally have been said after None. 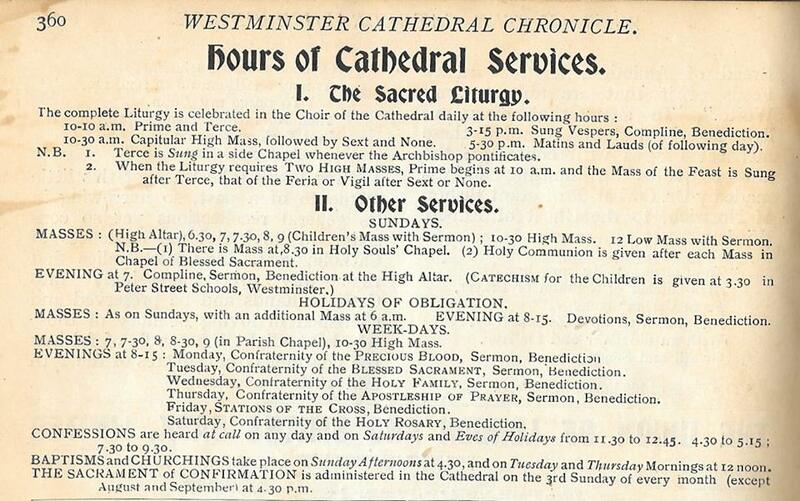 I imagine this arrangement must have been settled on as something which worked better with the schedule of the school and the regular congregation. The cathedral also has activities of five different confraternities scheduled during the week (Precious Blood, Blessed Sacrament, Holy Family, the Apostolate of Prayer, and the Holy Rosary), with sermons and benediction at four of them, plus Baptisms, the churching of new mothers, and Confirmations on a regular basis.